Trade Adjustments: FOMC Breakdown for NZD/USD? So that breakdown didn’t happen, huh? Well, I’m still keeping a bearish bias on this pair so I’m adjusting my entry strategy to catch a pullback at a much better price. In case you’re wondering what I’m talking about, make sure you look at my initial idea first. I had weird feeling in my gut (no, it’s not hunger!) that the FOMC announcement would spur profit-taking activity from dollar bulls because hawkish expectations were running so high that anything the Fed says won’t be good enough. Even though the official statement contained slight upgrades in assessment and the dot plot still reflected three rate hikes for this year, traders seem to be pricing in lower odds of tightening in June. Because of that, NZD/USD popped higher after the announcement and also seemed to shrug off weaker than expected GDP growth in New Zealand. The economy expanded by only 0.4% versus the projected 0.7% growth figure and the earlier 1.1% reading, reflecting a notable slowdown in performance and suggesting that the RBNZ might need to reconsider cutting rates again. But since the pair bounced off the long-term area of interest I was watching instead of breaking down, I’m moving my short entry level to the nearby pullback areas. On the 1-hour time frame, I’m seeing a descending trend line connecting the highs since February and the 61.8% Fib lines up with this area. This is also close to a former support zone, which might now hold as resistance. Stochastic is already indicating overbought conditions, though, and is turning lower to show a return in bearish pressure. In that case, the 38.2% Fib could already keep gains in check and push the pair back to the swing low. Still, I’m gonna be extra patient with this one since traders in the Asian and European sessions have yet to react to the Fed announcement and might cause a larger correction for NZD/USD. 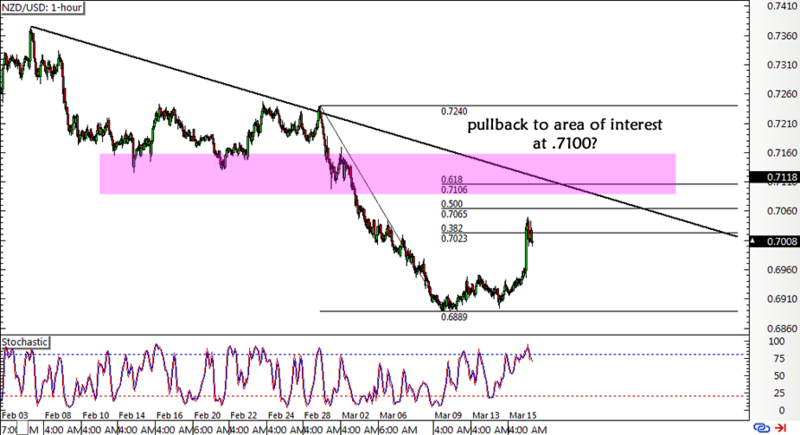 Short NZD/USD at .7075, stop loss at .7225, PT at .6925. I’ll be risking 0.5% of my account on this setup for a potential 1:1 return-on-risk but I’ll be ready to adjust my target lower and trail my stop if the .6900 level breaks.